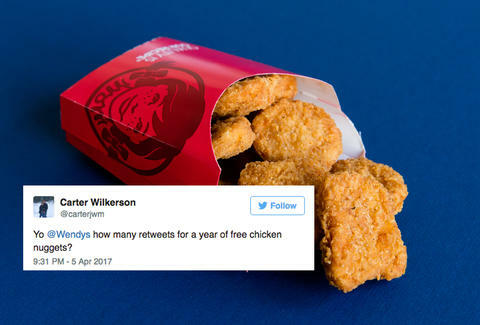 While McDonald's is busy dealing with rabid Rick and Morty fans demanding the return of Szechuan sauce, Wendy's is dealing with an incredible deluge of tweets after the company's pithy Twitter account made an unrealistic promise. It's an impossible number. The most retweeted tweet of all time is Ellen DeGeneres's Oscar tweet, which has 3.2 million retweets. Nonetheless, he's giving it a go. Wilkerson has done a noble job. He has collected more than 650,000 retweets in a little over a day. Yet even he recognizes the impossibility of the task and began negotiating. Wednesday morning, he promised Wendy's he'd never eat at another fast food chain if they made the goal 180,000 retweets. Wendy's didn't approve his request, but the company has given props to his hustle. Now, he's well beyond that self-imposed goal of 180,000 and has a full 3.6 percent of the 18 million retweet goal.